These Apple Cider Poached Pears in Cinnamon Sugar Puff Pastry are easier than you’d think, and use poaching liquid to make a caramel sauce! Apple Cider Poached Pears in Cinnamon Sugar Puff Pastry sounds sort of scary. Actually, just the word “poaching” sounds scary! Probably because poaching an egg is hard, poaching has gotten a bad wrap all around. But seriously guys, poaching pears could NOT be easier. The actual poaching process for these pears took less than 20 minutes (it could be up to 40 though, if your pears are larger! ), but it’s so hands off. You’re just simmering pears in liquid. To wrap and bake in glorious puff pastry only took another 30, so we were enjoying these poached pears barely an hour after I started them. And that includes the extra time I had to take pictures. Seriously, you can be enjoying these so soon. Uh, and in that time…you’re also MAKING CARAMEL. See…I couldn’t bear to throw the delicious smelling cinnamon stick-infused apple cider poaching liquid away, so I kept some of it, and reduced it down with some heavy cream, butter, and sugar for a seriously amazing apple cider caramel sauce. It’s the perfect thing to complement your poached pears, and it’s so easy. I’m all about adding a little crunchy something extra to every dessert, so I wanted to make my poached pear extra special. The puff pastry is the perfect something special! I love the way it looks, and I sprinkled mine with a little cinnamon sugar for an extra sugar-y crunch. That sugar gets just a little caramelized in the oven, and makes it perfectly crisp and sweet. And let’s talk about the stars of the show a little: the pears! I, personally, think that pears are totally underrated. When pears are good, they are sooo good. There’s nothing like a juicy, dripping-down-your-chin pear! Did you know you can check the ripeness of the pear by pressing gently on the narrow “neck” of the pear with your thumb? If it yields to pressure, it’s ripe! But underripe pears…not as good. That’s where poaching comes into play. It’s perfect for underripe pears, and so versatile. You can poach in pretty much any sweet liquid you want. I’m thinking coconut milk would be delicious, or hot chocolate?! Unlimited options (I’ll definitely be experimenting). Right now is the best time for pears too! There’s so many good varieties from USA Pears, over 10 varieties are being harvested right now. I used Comice pears, but use whatever your favorite variety is. In a medium saucepan over medium heat, combine the apple cider, water, and cinnamon sticks. Bring to a boil. As the cider mixture comes to a boil, peel your pears and cut off the bottom of the pear to form a flat surface. Place pears standing upright in the boiling cider mixture. Turn heat to low, cover, and let simmer for 15-30 minutes or until the pears are tender. This will depend on the size and ripeness of your pears. When the pears are soft, remove them from the pot and allow them to cool slightly. Discard cinnamon sticks from saucepan. Remove all except 1 cup of liquid from the saucepan. Add brown sugar, heavy cream, and butter to the poaching liquid and let simmer uncovered for about 7-10 minutes on low heat while you bake the pears. It should turn into a slightly thickened, light caramel-colored sauce. Remove from heat and let cool. Stir together cinnamon and sugar. Set aside. Cut puff pastry in 1/4" strips. Place pears on a parchment lined baking sheet. Wrap cooled pears with puff pastry starting at the bottom and working your way around the pear and upwards. When you come to the end of a pastry strip, brush it lightly with water and press to adhere to the next pastry strip. Continue wrapping until you reach the top of the pear. Tuck the end of the last pastry piece behind the previous dough spiral. Repeat to cover the other pear. Brush lightly with water or milk and sprinkle with cinnamon sugar mixture. Bake for 20-25 minutes, or until puff pastry is golden brown. Serve immediately with apple cider caramel and ice cream. There is nothing better than a good poached pear, I think! Love the autumn flavours. I have a love for pears that dates back to my childhood. My grandmother used to have pear trees growing in her yard and my cousins and I would pick them and eat them while sitting in the branches of the trees. These poached versions of my favorite are screaming my name to make soon! What a nice memory! Having a pear tree would be amazing :) Thanks, Joanna! These pears are freaking GORGEOUS. I am seriously loving that your wrapped them in puff pastry and that caramel is the bees-knees finishing touch! Thanks Abby! It really is easy! Poaching had me terrified too, and I was so pleasantly surprised at how quick and easy it was. Wow! These pears are stunning, Rachel. Great pour shot! This is the cutest dessert ever! And this caramel sauce… Yum! I wish I could drink it all! How gorgeous and fancy-pantsy are these pears (nobody would guess they are so easy!)!! I cannot wait to try this recipe! Pinned! What a wonderfully fancy looking dessert, that is actually very manageable, even for a “bad baker” girl like me. I can definitely see myself serving these at a dinner party, and it being a total show stopper. I just love this recipe! Especially that yummy sounding apple cider caramel sauce you made from the poaching liquid. So great Rachel! Thanks Natalie! These definitely don’t require any true “baking” skills – you can do it! Thanks Beth!! You have to give it a try – the results are sooo worth the little bit of effort! These pears are so beautiful! I love the way you spiralized the puff pastry around the pear. And the caramel sauce with the poaching liquid? TO DIE FOR. Thanks so much Sarah! The apple cider caramel sauce definitely pulls it all together. Let’s please pour caramel on EVERYTHING! 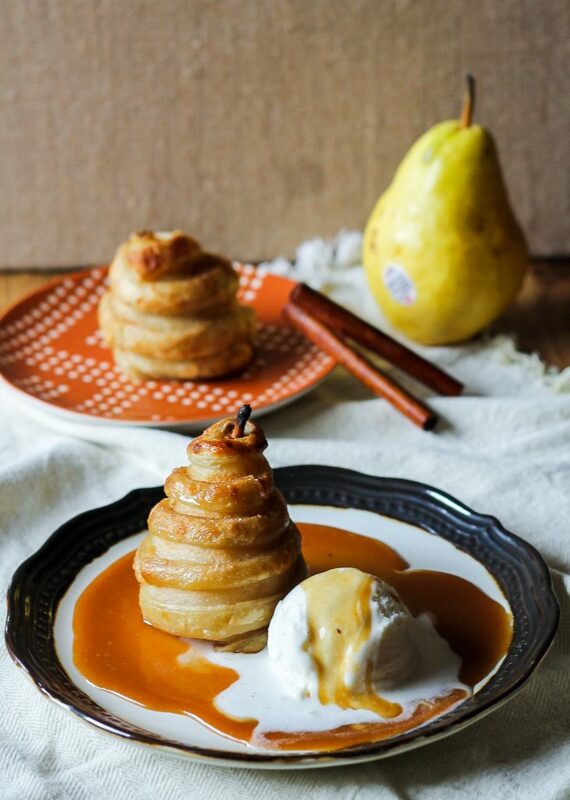 These pears are so, so pretty (and are made a million times better with that caramel). I always scorch it when I try making it at home but practice makes perfect…right? Rachel… this is mindblowing awesome! Like, poached pears are already bonkers great… and then wrapping in puff pastry?! Mind officially blown. Pinning the heck out of this! I LOVE poached pears and with that crust, caramel, and ice cream? I mean, are you kidding me?! Perfection! This is a beautiful dessert! What a great idea to wrap the puff pastry around the poached pear. Pinned and trying this Fall! Yum!! 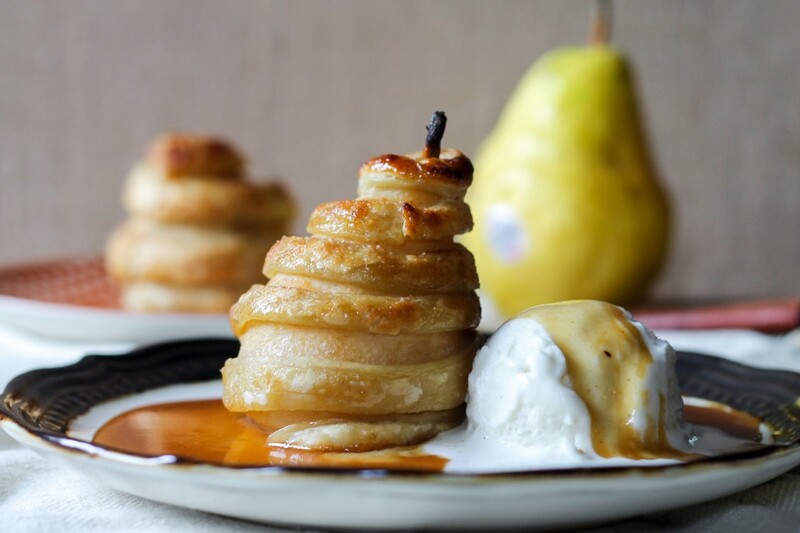 What a perfect way to use pears! I love that you wrapped them in puff pastry, they look so delicious! Those are so beautiful! What a fancy and impressive dessert. 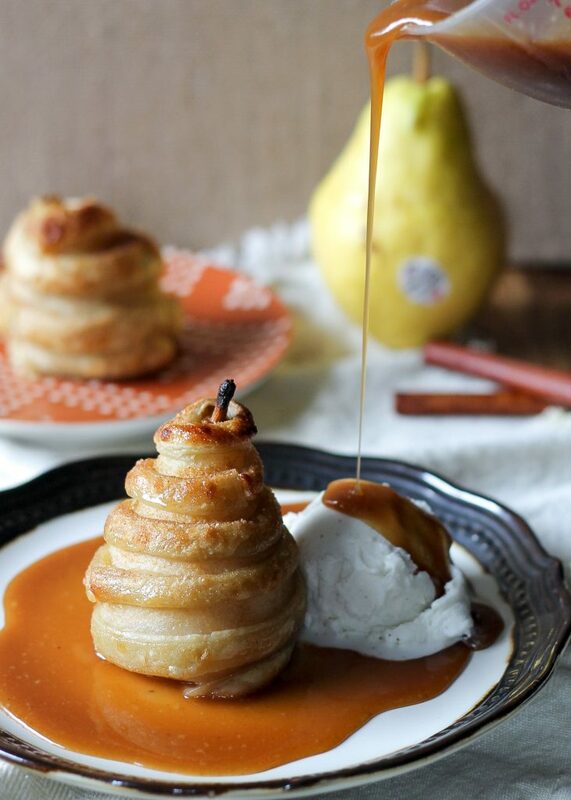 I love the swirled puff pastry around the pears! I never think to do anything with pears, but this is the second pear thing I’ve seen today that looked amazing so I’m obviously going to need to change my ways and use pears more often! What a clever idea. That sauce looks amazing and the puff pastry looks just right. BEAUTIFUL! Seriously! I am so in love with this! These photos are STUNNING. Wow! So gorgeous! I love the presentation, too, with the pastry around the pear (and alllll that caramel, YES). looks so fancy! very creative recipe Rachel! These pears are so gorgeous, Rachel! 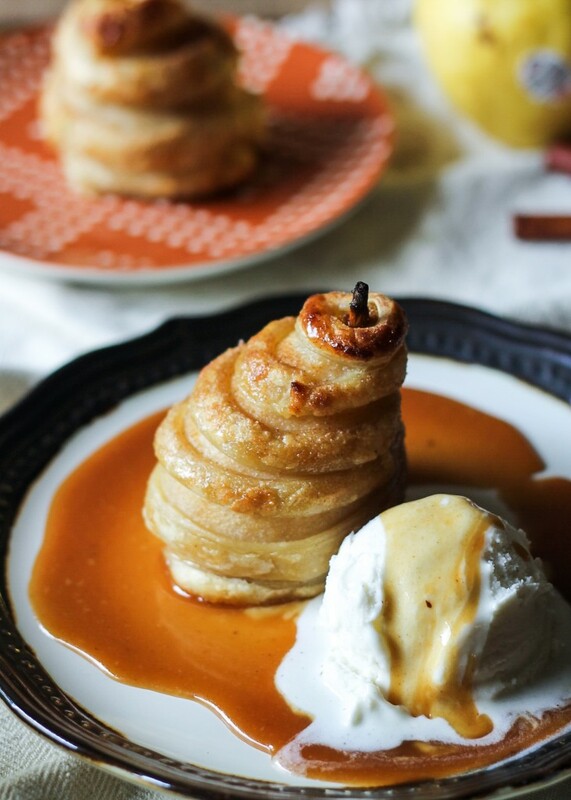 The puff pastry wrapped around the pear looks incredible and I could just drink up that caramel sauce! Pinning! BRB. Going to make this right now. Holy crap this looks delicious. I just made apple crisp last weekend but after seeing this I think I’m going to have to whip up another fall fruit dessert. Pinning pronto! Haha – I totally made apple crisp last weekend too! Can never have too many fall fruity desserts :) thanks Alex! Rachel, this recipe is AMAZING!!!! I love poached pears and puff pastry and wrapping puff pastry strips around these guys was simply brilliant!!! love love love and pinned! Wow, look at that sauce pouring over pears. Poached pears are my favorite dessert and I’ve made this version once as well, but I can’t stop but amaze myself at how elegant and exquisite poached pears look. Pinned! What beautiful food and photography! I love pears so this dessert looks beyond amazing! Oh wow – these just look SO amazing. What a clever way to wrap them, with the fruit peeking through – I love that! Thanks for a wonderful recipe! Gorgeous! I love poached pears but never wrapped them in puff pastry! Genius! So I’ve never poached pears before … which is just crazy. This may need to be my inaugural recipe to try – it looks amazing!! These are so gorgeous!! I love poached pears, but I think I’ve been doing it wrong this whole time because I obviously should have been wrapping them in puff pastry this whole time. :) So easy and elegant! Oh my gosh Rachel – these are absolutely gorgeous! They look like they taste delicious too! I’d love to have this on my holiday table this year! what should the oven temp be? Hi, it should be at 400ºF!